NUMB riders camped over night at the Boone County Fairgrounds Sunday, June 25th. 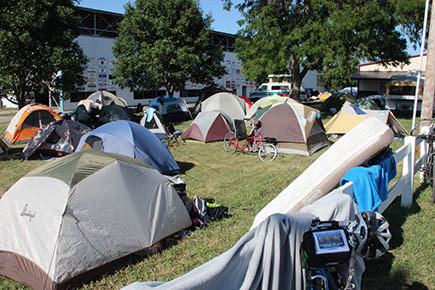 More than 110 bicycle riders were in Albion, June 25, Sunday and stayed overnight on their circle tour to raise money for world hunger relief. This was the 22nd annual Nebraska United Methodist Bike Ride (NUMB) sponsored by the Great Plains United Methodist Conference Risk Taking Mission and Justice Team. This was the first leg of their four-day journey covering more than 250 miles, and the first leg was the longest, covering 79 miles from the starting point at Wisner to Albion. The bikers enjoyed cool temperatures and favorable winds for the first day, and many of them had arrived in Albion by early afternoon.